A small, erect or ascending, tough-stemmed perennial, evergreen subshrub, that grows to a height of 1m. Very common throughout Australia, especially in tropical to warm temperate open grassy areas. Prefers light to medium well-drained soils in an open, sunny position; drought and frost tender. It is found in paddocks, gardens, waste places, disturbed forests and roadsides. It is an abundantly naturalised weed due to the range of soil types tolerated. The stem is erect, branching and covered densely with stellate (star shaped) hairs and is rather twiggy with tough stringy bark. The stem becomes glabrous (without hair or scales) as it approaches the top. 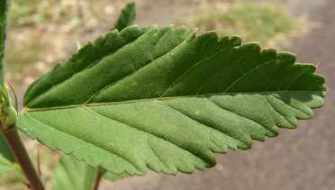 The leaves are dull green and lanceolate to linear-oblong sometimes rhombic, alternate and 1.5-8cm long, with serrate margins and finely stellate hairs on the upper surface of the leaf and a dense amount of stellate hairs on the undersurface, making that surface look white. The flowers are small, solitary, pale orange to yellow on slender jointed peduncles (stalks) about 10-30mm long. The peduncles are mostly axillary (formed in the angle between the stems) but sometimes there are clustered of 3 or 4 at the end of branches. The calyx (collectively the sepals of one flower) is a 5-lobed, 10 ribbed ashy green colour with stellate (star shaped) hairs. The corolla (the petals collectively) is 7-8mm long and consists of 5 petals that are united at the base. The fruit (schizocarp) is 5-6mm in diameter, glabrous (without hair or scales), a dark brown colour, more or less globular and vertically ribbed. It is divided into 9-12 fruitlets (mericarps) acting as seeds. In the fruit, the mericarps (fruitlets) are hard and often indehiscent (not opening to release the seed) with a wide back and honeycombed or reticulate sides. The mericarps have 2 erect minutely barbed awns.